Unequal access to healthy food based on income and specifically within low-income neighborhoods is a huge problem in America. 2.3 million Americans live over a mile away from a grocery store without access to a vehicle. This has created something known as a â€œFood Desertâ€ where entire low-income neighborhoods are under-served in access to the basic human right of healthy, unprocessed food. People living in low-income areas spend significantly more time (19.5 minutes) traveling to the grocery store than the national average (15 minutes) according to the USDA. The USDA has also created this Food Desert Locator, albeit somewhat inaccurate as it does not take into account corner stores with fresh fruit and vegetables, it is still a step in the right direction. To examine these inequalities I am creating a performance walk and interactive mapping project. 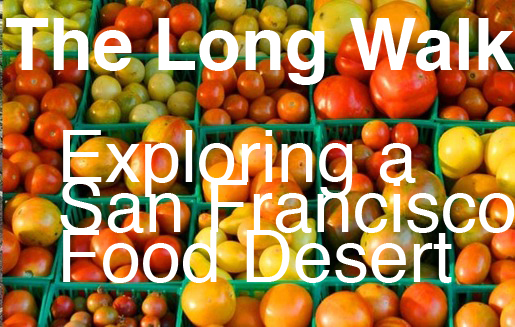 â€œThe Long Walkâ€ will focus on the Hunters Point Food Desert that exists on local level, within the San Francisco community. This piece will combine a two and a half mile walk and shopping trip from the center from Hunterâ€™s Point Hill to the Super Save Market and back, combined with an interactive web map recording the experience. At the market, which is the closest market to the center of Hunter's Point, I will purchase enough food for three days meals and carry the groceries back on foot. The walk will act as metaphor for labor and duration. I want to express the labor and work it takes residents of low-income neighborhoods to access healthy food, that is so much more accessible to those that live in better serviced neighborhoods. While we walk I will document theÂ four mile walk with geo-located photography and journaling. I will also record the number of steps we take and create step markers every 500 steps on the map. Our pictures, thoughts and memories will be captured and mapped the published on the web. The Long Walk starts at 12:20 and we should be back to the Hunters Point starting point by 3pm. Bring comfortable shoes, a cellphone or camera and water.